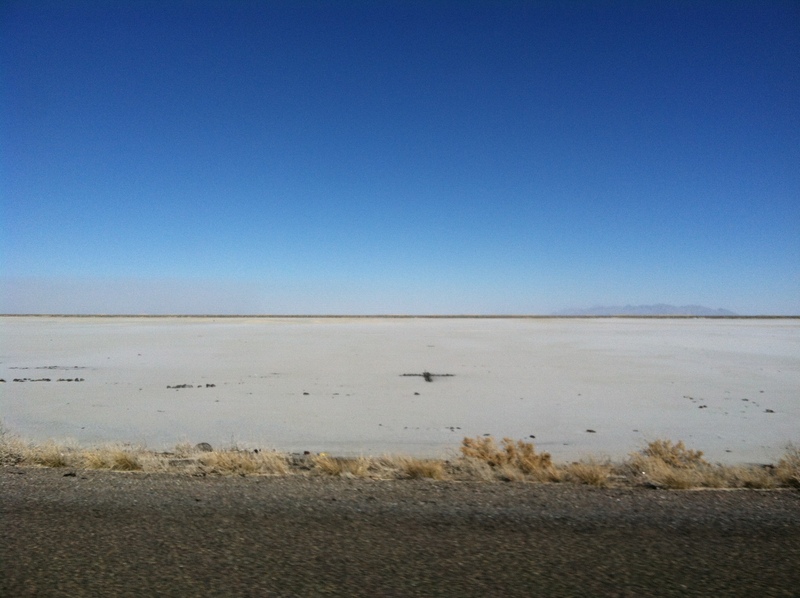 The Bonneville Salt Flats from I-80. 170 years later and 120 miles west, I’m sitting in the Taco Time in Wendover, fifty feet from the Nevada line, trying, in vain, to finish a Big Juan burrito doused in hot sauce. You can’t help but feel sad for Wendover. Once a railroad town, the site where the first transcontinental telephone was completed in 1914, then a training field for bomber pilots during World War II, there’s a patent down-on-its-luck feel about the place. It’s a dusty trailer park of a town made up of the Shell and Sinclair stations, a laundromat, a pawn shop, the old airfield, a movie theater/video store hybrid, and a few blocs of crumbling cinderblock apartments collapsing under two hundred satellite dishes. 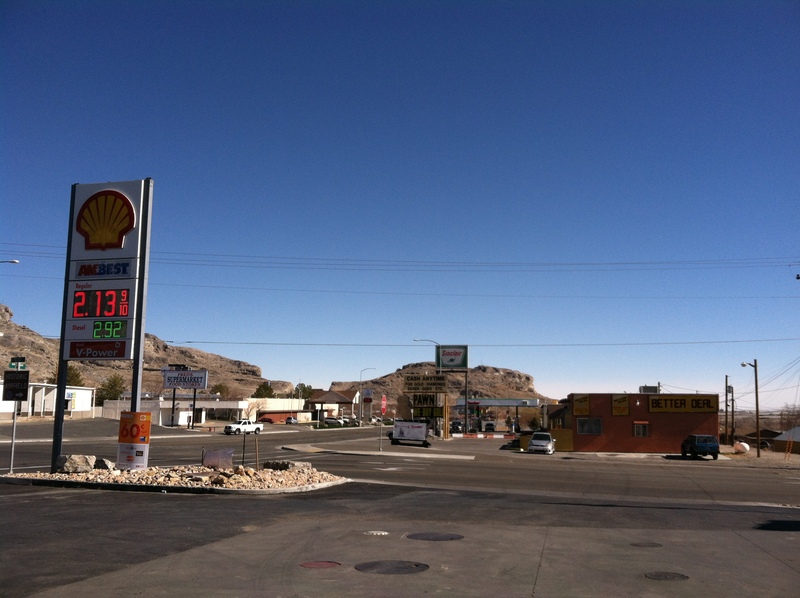 The oasis of West Wendover, Nevada. But across an artificial white line painted down the middle of the main street lies West Wendover, Nevada — a mirage of flashing lights and flashing breasts, a Mos Eisley of truckers and gamblers and drinkers pounding Katy Perry tunes way out in the middle of nowhere, an oasis of signposts in place of date palms. Wendover, at least the Nevada side, exists nowadays for one reason and one reason only: it’s where the puritans of Salt Lake go to gamble, drink, smoke, see dancing girls, and, by and large, do all the things they can’t do or won’t do back home under the watchful eye of Brigham Young’s descendants. 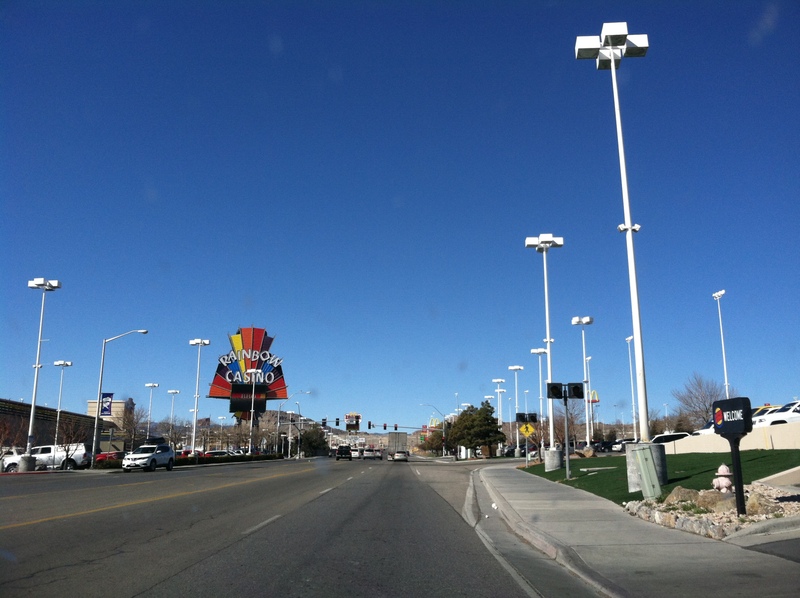 Wendover Boulevard is lined with parking lots and the five main casinos: the Red Garter, the Nugget, the Peppermill, the Montego Bay, and the Rainbow. But, easy comparisons aside, this is not Vegas. There is no New York here or Paris, no grand pyramid or Caesar’s Palace, only a row of buildings with all the architectural charm of a strip-mall Olive Garden or a Courtyard by Marriott. You don’t see Vegas’s casual tourists, the ones who see eat at Bouchon, browse at Cartier, and stand in line to see Céline. Here, the grass is astroturf, the license plates are all Utah, and the big names at the Concert Hall are Foghat and Tanya Tucker. In the faint, eternal twilight of the Rainbow, there are no Midwestern tourists or revelers up from LA for the weekend, only the intricate topography of faces grizzled by pack-a-day habits, drowning in coffee, always one coin closer, they hope, to a different life. Across the line in Wendover, Utah. Out the window of the Taco Time, I see three kids playing with a tire. My traveling companion thinks I’m joking at first, that I’m mocking life in Wendover, that even out here, 100 miles from the nearest city, 120 miles from any real city, kids couldn’t possibly grow up playing with tires. But there they are, across the street, three teenagers rolling a tire around a track. Beyond them lies the airfield and the rusted cadaver of the hangar that once house the Enola Gay. And beyond that, stretching off to infinity, is a wasteland of sand and salt and dust, vaster and emptier and quieter than anything you’ve ever witnessed. From the window of the Taco Time, you see why Brigham Young, looking down into the Salt Lake Valley, knew he had found the place to make the dessert blossom like a rose. Had he traveled any further west, he and his followers would have inherited an unforgiving earth — a land of table salt, the occasional seagull, and little else. Almost exactly a year before Young arrived, the Donner Party had attempted the challenging crossing of the salt desert. (The wagon track of that crossing were still visible in 1986.) Thirst, broken wagon wheels, and harsh conditions delayed them for a month, placing them in the Sierra Nevadas in time for an early snowfall and the eventual light snack that earned them their place in infamy. It’s no mystery why, for Young and his bunch, Salt Lake City was the place. I-80 entering the Great Salt Lake Desert. 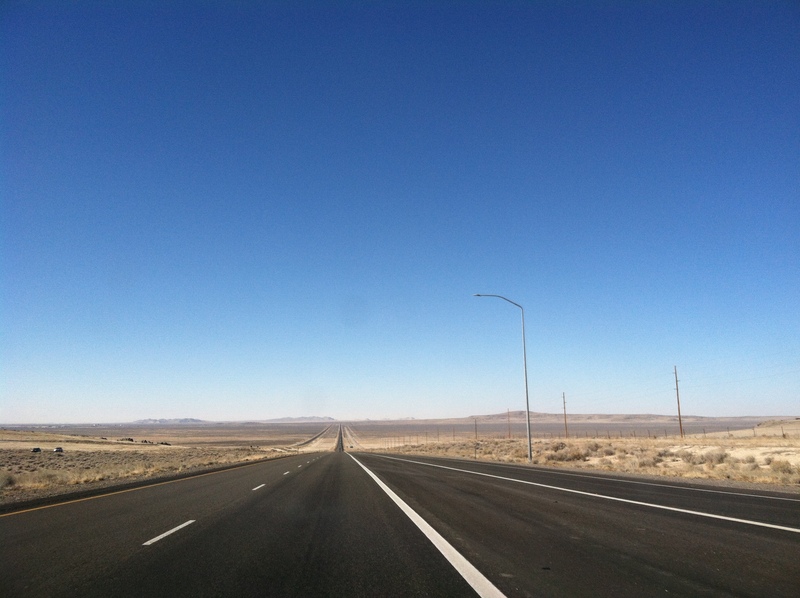 The drive along I-80 from Salt Lake to Wendover is about as extraterrestrial as they come. You leave the valley past the enormous Kennecott Smokestack (at 1,215-feet tall, nearly as tall as the Empire State Building and the mountains behind it) and drive across a valley — actually called Skull Valley — pockmarked with rectangular ponds, some red with algae; lakes, a brilliant cyan; and dried-out salt pans so white and reflective they blind you. People have written messages with rocks in the salt pans — greetings, warnings, memories, and symbols of love. You drive across long, straight causeways parallel to other long, straight causeways carrying roads and railroads and utility lines. Among them you see poles still bearing the contorted shapes of trees, their wires cut and hanging limp. There are factories out there too among mountains of salt, reminding you of the state’s motto, “Industry,” a reference to the beehive Brigham Young imagined for this place. The Morton Salt Girl, in her bright yellow raincoat, stares back at you from across the pallid desolation. Once you round the Cedar Mountains, you’re in the Great Salt Lake Desert proper, the bed of a pleistocene inland sea that once rivaled Lake Michigan in size. You pass through scrub vegetation, past a few herds of cattle, past exits for old railroad towns like Arinosa and Barro that disappeared generations ago, before you head out onto the salt flats. 25 miles before Wendover, you pass an 87-foot-tall sculpture that looks like six tennis balls and baseballs on a squarish trunk. 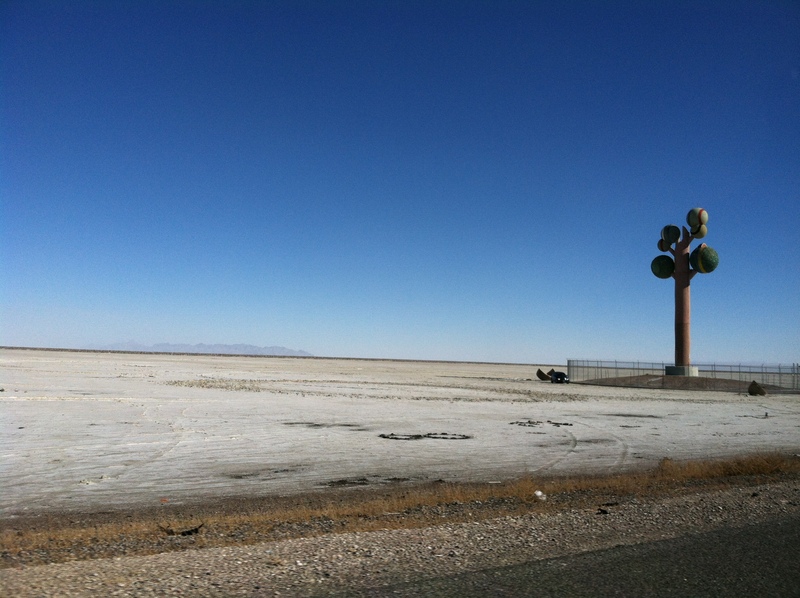 Metaphor: The Tree of Utah was installed here in the mid-1980s by a Swedish artist who, driving this same stretch of road, had had a vision of a tree. Inscribed on the base are the words to Schiller’s Ode to Joy. A fence surrounds the sculpture to protect you from falling tiles. “Metaphor: The Tree of Utah” along I-80. Eventually you arrive at a rest stop in the middle of the Bonneville Salt Flats, forty square miles of brilliant white salt surrounding pink and purple mountains called islands. This place is so flat, it is said you can see the curvature of the planet in its horizons. In the summer, for more than a century now, motor sports enthusiasts have come to the so-called Bonneville Speedway, little more than a cul-de-sac miles out into the flats, to race each other and set land speed records. But in the winter, the salt flats are covered by about an inch of water. The combination of the thin layer of water and the white salt create a mirror that reflects the surrounding peaks. Aside from the cold wind, the only motion here is a red Volkswagen and a navy blue minivan making donuts and the steady westward stream of the shadows of caravans along the Interstate several miles to the south. After staring out at the emptiness for a while, I knelt down, took some of the salt on my ring finger, and licked it. It’s strange and oddly humbling to taste the earth. View from the end of the paved road at the Bonneville Speedway. What I find most moving about the West is how humbling it is. 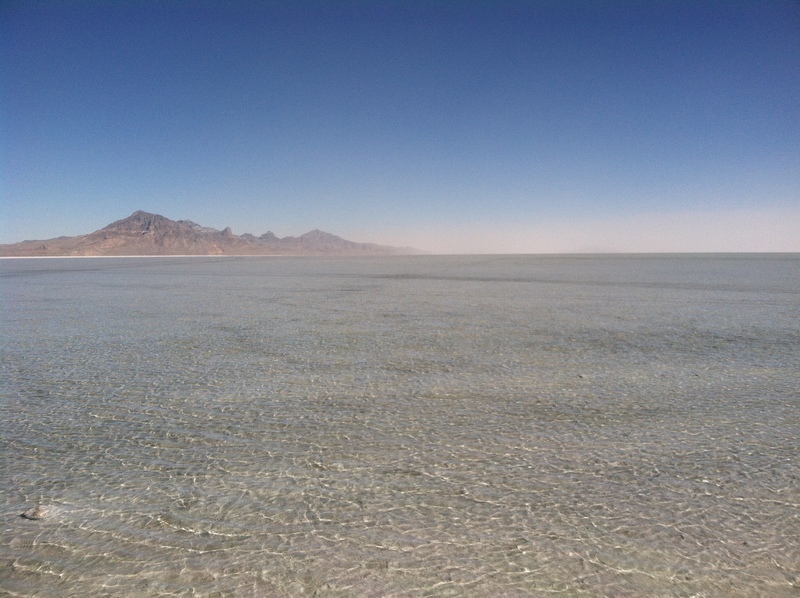 A day earlier, standing on the shores of Antelope Island in the middle of the Great Salt Lake, my traveling companion mentioned that, for the first time, he could understand why a religion should have taken root here, especially a religion like Mormonism that finds special significance in the American landscape. There’s a certain scale and grandeur to the most breathtaking vistas of the west, the view from Antelope Island and the view out across the salt flats among them, but also an emptiness and an isolation that almost compel you to search within. 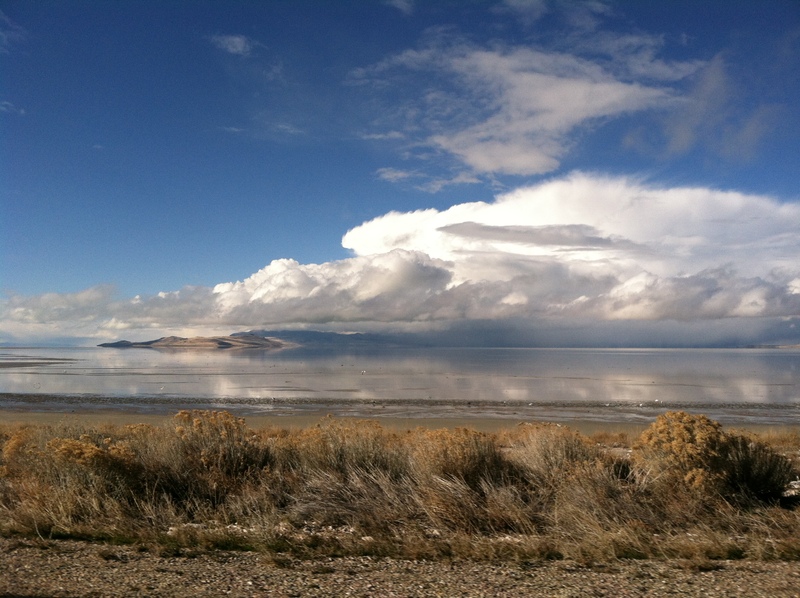 We drove to Antelope Island through a blizzard that, as we got further away from the Wasatch Mountains and closer to the lake, gave way to clouds and crisp blue skies. To access the mostly barren island, you drive across a curving, seven-mile-long causeway. Here, thousands of miles from a coast and nearly a mile in the sky, you find beaches — real, sandy beaches — bordered by stands of juniper, yellow ricegrass, and purple sage. Standing on the beach, you see look across the perfectly still, glassy waters to hilly islands that rise from the water like the backs of whales and rainclouds that move across the lake dozens of miles away. The clouds of the blizzard we’d driven through moved like an anvil along the snowcapped mountains behind the cities. A drive up Buffalo Point provides a sweeping vista west over the lake and back over the island toward Salt Lake City and the Wasatch Mountains. I said it looked like parts of northern California, he said it reminded him of South Africa or Iceland, but, in reality, with its colors and textures, with its tapestry of environments, with the surreal sense of being by the ocean in the middle of a continent and a mile in the air, there’s nowhere quite like it. 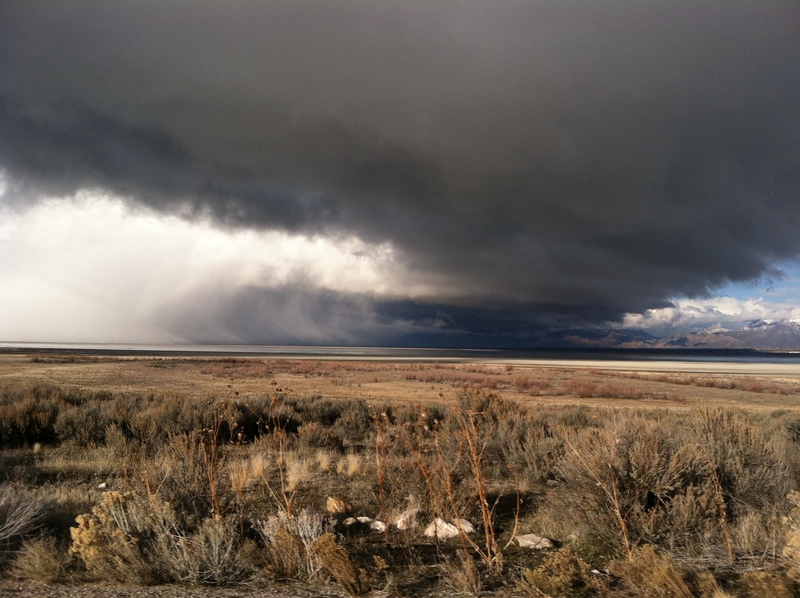 Storm clouds over Antelope Island. Back at the Taco Time at the end of the earth, I’ve made it through half of the Big Juan and one and a half hard tacos before I call it quits. I stare out the window again. For a vast nothing of salt and sky, that desert out the window is a lot of things: the long, straight highway between Salt Lake’s piety and Nevada’s false promises; the place where, each summer, men and women challenge themselves, each other, and sound itself; for the Donners and others, a place of death, but made from the very substance that flavors our nourishment and gives us life; a place that feels out of time but serves as one of the more visible textbooks of our history. A sixteen-wheeler pulls into the parking lot behind the gas station and the three teenagers across the street still roll their tire. The washers and dryers in the laundromat downstairs whirr like the winds across the salt flats as Miley Cyrus intones “Wrecking Ball” on the TV at the other end of the dining area. A man and a woman in t-shirts despite the cold, sullen and drawn, eat quesadillas and sip sodas. I’m not sure whether they’ve lost money at the casinos or they’re condemned to live here, but they sit as silent as the desert and never speak. Looking out over the Great Salt Lake. I love your writing style! You omitted mention of the fact that the dead town of Wendover, Utah attempted to be annexed by the State of Nevada. Interestingly, Nevada was willing to welcome the town and Utah, having no objections, said “good riddance!” Couldn’t be more perfect, right? Not so fast. Congress has to agree to alter interstate boundaries. Considering that those boundaries were set by treaty during the 19th century, Congress wasn’t willing to mess with it. And so, Wendover is slowly fading away in the shadow of its ramblin’, gamblin’ sister across the street, and will one day become just another ghost town, a reflection of the vacant salt flats to the east. Something about desert landscapes always makes for inner contemplation. Did the Swedish artist inscribe “Ode to Joy” on the base of his work, or was this done by someone else? I wish that I could read more posts like this. Heck, I wish I could read more articles like this in the press!